Drawing a bead during squad-level training at Fort Indiantown Gap. An Army unit is only as strong as its most unprepared Soldier; if that one person fails in his or her duties, it could spell disaster for the entire mission. In an effort to eliminate any such weak links, the 1st Battalion, 114th Infantry spent their Annual Training practicing squad-level infantry tactics at Fort Indiantown Gap (FIG), Pa.
More than 200 Soldiers from the 114th and the 250th Forward Support Battalion returned to the basics of Soldiering, honing squad level skills such as Movement to Contact, Deliberate Attack, Conduct a Presence Patrol, and Enter and Clear a Building. They also shot their weapons at the M203, M16, and reflexive-fire ranges, and took part in an Army Physical Fitness Test (APFT). The objective of the training, according to Capt. Rich Karcher, Headquarters and Headquarters Company commander, was to educate the younger, lower-ranking and less-experienced Soldiers - those who typically form a squad - by teaching them basic techniques using the "crawl, walk, run" method. "It's a refresher," said Pvt. Christian Pettit, an infantryman participating in his first AT. "We're learning new stuff, little extra details." "It's getting more in-depth," added Pvt. Christopher Allen, who explained that he is getting to practice, for the first time in a real-world environment, what he learned in school. Acting as Observer/Controllers (O/Cs) for the training at FIG were the unit's platoon leaders and platoon sergeants. Though not standard procedure to have a unit O/ C its own training, it allowed the platoon-level officers and non-commissioned officers (NCOs) to observe their squads and mentor their squad leaders. Although the unit is scheduled to train each year at Fort Drum, FIG has been the training area of choice for the past four years. It's especially appropriate this year, explained Karcher, as the unit is transforming from heavy infantry to light infantry. The net result of that transformation will be the loss of one company and all track vehicles. 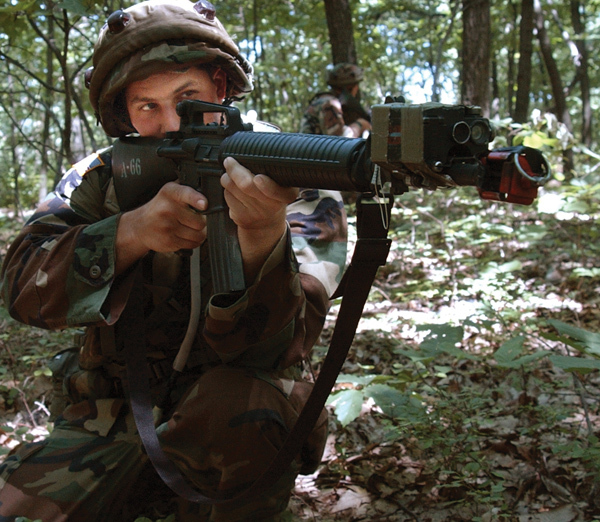 "Due to the fact that we're squad level and we're going to light, Fort Indiantown Gap suits our needs," Karcher said. "They're all about training." The same could be said of the Soldiers of the 114th.